4 Diamante Sandpearl Resort em Clearwater Beach, a apenas classificado # 8 Worldwide da Select da Expedia Insider na satisfação do cliente e valor. Esta suite Sandpearl possui uma área de estar muito bem equipada com uma cama queen-size completa e varanda privada para capturar as vistas mais requintadas da cidade e do porto. O quarto principal tem uma cama king size e também inclui uma banheira de jato e um chuveiro separado e pias duplas. A suite tem 2 varandas privadas. A suíte com todas as comodidades padrão dos quartos, esta suíte também oferece máquina de lavar e secar roupa no quarto, cozinha gourmet completa. Esta suíte no último andar está voltada para o leste e tem uma vista espetacular da Baía de Mandalay. Spa de classe mundial no Sandpearl Resort: Terapias restauradoras de spa inspiradas no oceano nos banham com os elementos curativos do mar. Purifica a água. Ervas rejuvenescer. A alquimia da essência inspira. A natureza é sábia. O Fitness Center do Sandpearl Resort conta com equipamentos cardiovasculares e de musculação Life Fitness e aulas de ginástica em grupo para enriquecer sua saúde e bem-estar. Aberto às 6:00 da manhã. Kid's Camp - Camp Ridley no Sandpearl Resort: Deixe as crianças aproveitarem suas férias com programas completos e de meio dia disponíveis. Por favor, visite o site do hotel para os guias de programação e preços no site ..
Casas de banho mestre incluem uma banheira de hidromassagem romano, banho de vapor separado, e pias duplas. Para uma experiência agradável, Sandpearl Esta suite de 1 quarto tem uma vida muito bem decorados e espaço de entretenimento com varandas privadas para capturar as vistas mais requintados. Com todas as comodidades-padrão dos quartos de hóspedes, esta suite também oferece amenidades tais como prémio lavadora no quarto e secar roupa, cozinha gourmet completa e uma banheira de hidromassagem relaxante no banho mestre. Esta suite Sandpearl convida a desfrutar de um retiro íntimo que está empoleirada ao longo da costa com vista panorâmica sobre Mandalay porto ea Ilha Clearwater. Relaxe brisa do Golfo como suaves sussurram através das janelas abertas e permitir que nossa equipe exigentes para atender a todas as suas necessidades. Recently stayed for a winter getaway. From the beginning right til the end of our stay, Tom was attentive and responsive to every detail. The resort and beach are first rate with everything within walking distance, but working with Tom made this the best rental experience we have ever had. Can't wait to get back! Thank you for your review and feedback on your stay with us. We are glad you enjoyed your stay and we look forward to your return visit in the future. This was our second stay at this unit and all I can say is that it is perfect! The unit itself is first class and is spacious, clean and elegant. The view from the two decks is wonderful and even better than the gulf side. The kitchen is well stocked and we ate breakfast out on the deck often. 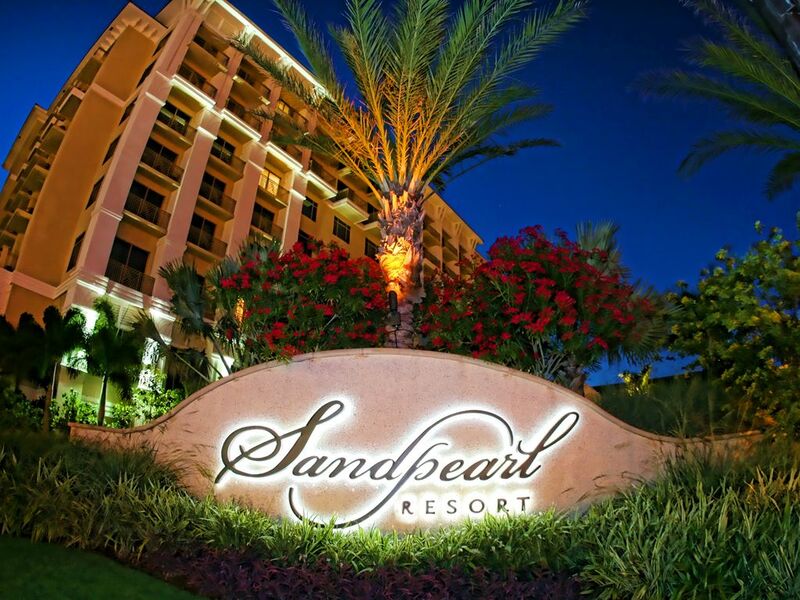 The Sandpearl Resort is the very best resort in Clearwater Beach. The pool, available lounge chairs, and the staff all make for a great experience. We stayed for 9 days and our only regret is that we couldn’t stay longer. The owner Tom is great as he’s helpful and very responsive. The town is filled with great eateries and shops. Clearwater Beach is one of our favorite places and we will be back again soon. Thank you for your review. We agree, the Sandpearl Resort on Clearwater Beach is the best beach in the USA, and USA today agrees with us. So happy to hear that you found everything to be prefect during your stay with us. We look forward to your next visit with us. From the minute you walk into the lobby to your last walk out the door, you will be treated with grace from the staff. The suite was beautiful with its bay view. The pool area was very nice and had very comfy lounge chairs. The beach was so clean and sand so white. We will be back again. Thank you Lynn for your nice review of your stay with us. We are glad you enjoyed your time at the Sandpearl. Everything you need, so nice. Great friendly service. Tom was very informative and helpful. Thank you for your review. we are glad you enjoyed your stay with us and we look forward to your return. Great stay, had everything we needed! We had a great time at the Sandpearl. Tom was super responsive and easy to work with. The condo had everything we needed, and we loved the resort! Thank you for your review and we are happy to hear you enjoyed your stay with us. We look forward to hosting you again in the future. Celebrating the wife’s 50th Birthday. The owner & his staff went above & beyond to make our stay extra special. Thank you for you review. e are happy to hear that your stay with us was everything you wished for. 2/10 de uma milha a norte de Pier 60 e está a uma curta distância de todas as comodidades oferecidas na praia, incluindo a Marina, onde você pode levar mais de 50 excursões de barco diferentes, como pesca, encontros com golfinhos, o Navio Pirata, Putt-Putt Golf ou uma noite jantar no mar. Do outro lado da rua do parque da praia da cidade e do Palm Pavilion Cafe na praia. Tampa Bay, o aeroporto, Busch Gardens estão dentro de uma movimentação de 40 minutos, Orlando e Disney atrações sobre uma unidade de 1. 5 horas. Rates are based on what the hotel charges for the same suite and can change monthly. 25% refundable deposit required for reservation with balance due 30 days prior to arrival date. The refundable deposit is 100% refundable if reservation is cancelled 30 days or more before arrival date.